Looking out from its orbit around Earth, the Hubble Space Telescope sees Pluto and its moons on two occasions three days apart. Astronomers using the Hubble Space Telescope have spotted two new moons orbiting Pluto. After Pluto was discovered in 1930, skywatchers didn't know for many years it had any moons. Then, in 1978, astronomers on Earth discovered a smaller body orbiting around Pluto. They named that moon Charon. The two moons discovered in 2005 were labeled S/2005 P1 and S/2005 P2. After their discoveries are certified by the International Astronomical Union, they will be given names selected from mythology. Pluto is named for the lord of the underworld and Charon is named for the ferryman of the dead. Where are they? Pluto, the ninth planet in our Solar System, is about 3 billion miles from the Sun in a faraway region of the Solar System known as the Kuiper Belt. 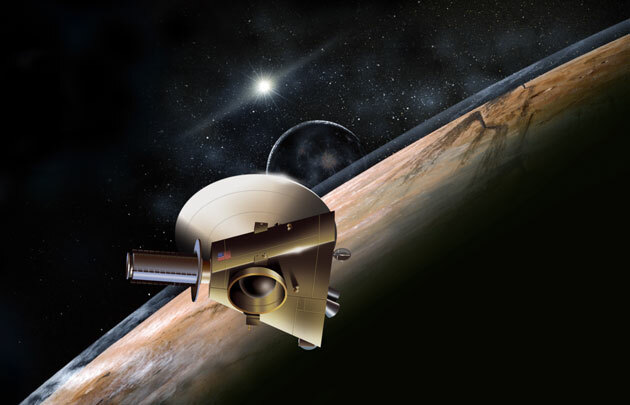 S/2005 P1 and S/2005 P2 are approximately 27,000 miles away from Pluto. The objects are about two to three times as far from Pluto as Charon. The Hubble's Advanced Camera for Surveys first observed the two new moons on May 15, 2005. Three days later, Hubble looked at Pluto again and saw the two objects still there. During the intervening three days, they appeared to have moved slightly along their orbits around Pluto. To the astronomers viewing them with the Hubble telescope, S/2005 P1 and S/2005 P2 appeared to be 5,000 times fainter than Pluto. A NASA artist imagines the Pluto system as seen from the surface of one of the candidate moons. Pluto is the large disk just right of center. Charon is the smaller disk at the right of Pluto. The other candidate moon is the bright dot on Pluto's far left. Relative sizes. The first natural satellite of Pluto to be discovered was Charon found in 1978. At 728 miles (1,172 km) in diameter, it is larger in proportion to its planet than any other planet's moon in our Solar System. Pluto's diameter is 1,413 miles (2,274 km). Charon is about half as wide as Pluto. In 2005, astronomers discovered two more moons orbiting Pluto. They are tiny bodies merely 35-125 miles (60-200 km) in diameter. Temperatures. Charon, which has no atmosphere, has an average surface temperature about –364°F (53°K). Pluto's average surface temperature is about –382°F (43°K). Charon's surface temperature varies widely, as does Pluto's surface temperature, because of Pluto's orbit, which carries it in as close as 30 astronomical units (AU) from the Sun and swings it out as far as 50 AU. An AU is the average distance from the Earth to the Sun, about 93 million miles. At about three billion miles distance from the Sun, Charon along with Pluto and its other two moons are 30 times farther from the Sun than Earth. Out there, they receive only 1/1000th the amount of light Earth receives. The discoverers. The astronomers were at Southwest Research Institute, Boulder, Colorado; Lowell Observatory, Flagstaff, Arizona; and Space Telescope Science Institute, Baltimore, Maryland. The Hubble Space Telescope is a cooperative project of NASA and the European Space Agency. Space Telescope Science Institute conducts Hubble science operations. The Institute is operated for NASA by the Association of Universities for Research in Astronomy, Washington, D.C.